In 1991 The Topps Company, Inc. (or simply Topps to most) celebrated 40 Years of Baseball, to mark it’s 40th anniversary into the business of baseball trading cards. 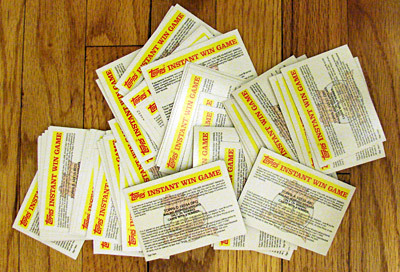 The celebration was marked by a sweepstakes and instant win game where old classic cards were randomly inserted into packs of the 1991 cards. Odds of winning this way were 1 in yeah right! Each pack also contained a sweepstakes entry card which could be an instant win card (very unlikely) or you could fill out the entry form and mail it in for a chance one of 41 fabulous prizes! The grand prize was of course all 40 sets Topps ever produced. 40 other prizes were each of the 40 sets individually. I opened hundreds of packs that year. 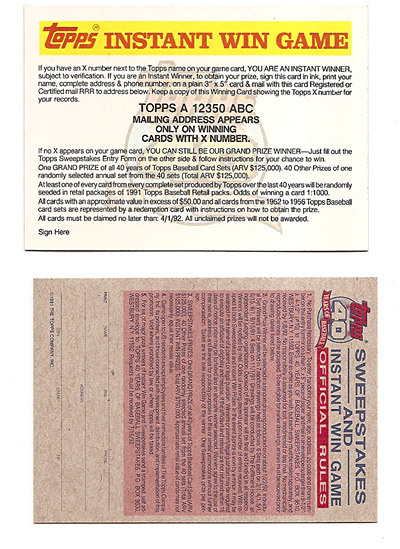 I did not open anything but cards from 1991 in my packs, I did not win instantly, and I certainly did NOT fill out any of the sweepstakes entry forms included in each and every pack I opened. I DID however save all of them. I discovered them recently in a box full of other advertisement insert cards, puzzle pieces and stickers from various sports cards packs I’d opened during the early 90s. There they were packed neatly in a row, all perfectly preserved and in mint condition, as if to say “shouldn’t we be prize enough?”. Yes, yes you should. Morbius is one of those pesky Marvel characters that invades the story lines of otherwise respectable titles in order for Marvel to maintain their copyright. He first appeared for a short time in the mid 70s and then promptly vanished from existence for nearly two decades. Then for some reason, in 1992, they decided to revive the already “Living Vampire” and give him his own series. 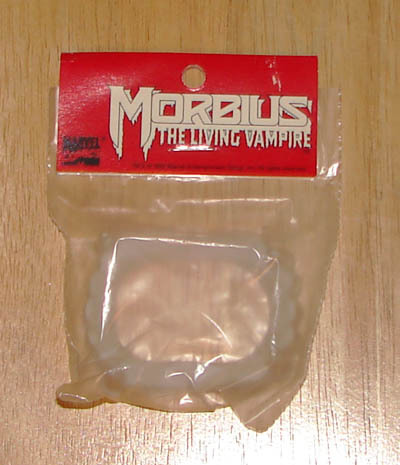 To promote this return of a character 90% of their audience had never heard of, they distributed these plastic fangs to comics stores who then passed them out for free to their customers. I got my pair, but of course never opened them. (They’re worth more sealed). I’m not really sure why Marvel thought handing these out would lead to sales, but this was the early 90s, the comics industry was in free fall, and there was no limit to the kind of wacky tricks they were willing to try to turn their numbers around. In an era of issue #0′s, multi-variant gatefold covers, and polybags, this little item was barely even visible on the hype radar. The Morbius series lasted a full three years, ending in 1995. Since then he has had numerous cameo appearances. I’ve never read any of them.